I’ve had my Silhouette for 3, maybe 4 years now? 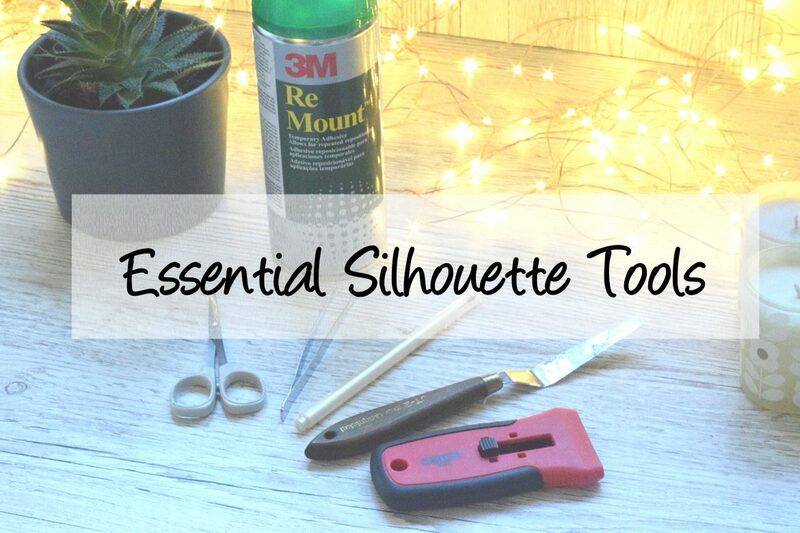 Over the years I’ve built up a little supply of Silhouette tools that I’d call pretty essential for anyone just getting into using the machine. While many of these are geared towards sticker making primarily, I use most of these when cardmaking too. Tweezers are a bit of a given really. They massively help to get those small die cuts picked up off the mat. Particularly with card stock I find if I’m not careful I just fray the edges of the card when trying to pick it up off the mat. The ones I use were just part of the a cheap set I picked up at The Range. You can get super fancy ones, with a precise point but I’ve never really needed them. The Pick and Place tool I only got last year and was a revelation! When I’m cutting out an intricate die cut when I pull it off the cutting mat those little bits in the middle are still attached and it’s a faff to get them out. With it’s sticky end you can just use this tool to pick out those little annoying bits! I can’t believe I went so long without this! New mat day is pretty terrible. When the cutting mat is so sticky it doesn’t want to let go of your media! This palette knife/painting knife is perfect for helping free your cuts. You can simply get this underneath your cut and use it to help pry the cutting mat away from your material. I tend not to use this on sticker paper though, as I can be a little heavy handed and bend the paper. It’s perfect for freeing cardstock though. This Wilko window scraper is something I actually stole from my boyfriend. He bought it (for I think only £1 but I can’t find it on the website to verify) to clean off his print bed on his 3d printer. On one new mat day I had loads of sticker paper left on my mat that I needed to scrape off. Ed suggested I try this scraper and we’ve been ‘sharing’ it ever since. You can’t press on too hard otherwise it will slit the mat but if you get the right angle it will lift off all paper residue left on your mat. As much as new mat day is terrible, the stickiness doesn’t really last that long. That’s where this stuff comes in handy. For less than the cost of two cutting mats from Amazon (it’s at £18.51 as I write this and cutting mats are £11.99) you can get a can of 3m Re Mount. I’ve had mine for weeks now and barely any has gone. As soon as things start coming off the mat too easily, it gets a quick spray with this. Yes you can fix your sheets into place with some washi, but it won’t stop all slippage. Also, I’ve found that the wrong washi will interfere with registration marks. With this I can now use mats until they actually break and my mat costs have gone way down. Now it’s just the basics, and largely things you’ll already have lying around. Scissors are a key one. I have two sets – first a small set just to tidy up my cuts. Sometimes with intricate die cuts you get little frays that just need chopping off with a small pair of scissors. The second set is a larger, more regular pair. Again it’s just to tidy up cuts but it’s helpful to have a couple of sizes on hand. Next is a little brush. I actually use an eyeshadow brush. The machine can get incredibly dusty and if you’re using the print and cut function you need to keep that area as dust free as possible. An eyeshadow brush is just the right size I’ve found to get into all the little areas. A keyboard vacuum would also work quite well! Finally is a craft knife. Again it’s just something to help with those precise little cuts that can sometimes not turn out that great. It’s also handy when you do a cut and realise it’s not the right blade setting and you need something just to quickly go over the cuts with. If you’re debating buying a Silhouette hopefully this has helped with the shopping list of the extras you may need. If there’s anything you use with yours that I haven’t listed, please let me know in the comments below! This post contains affiliate links. They don’t cost you anything, but they help support the blog.